Providian Medical sells new and refurbished ultrasound transducers from every manufacturer. Our refurbished probes are tested and assured to meet or exceed manufacturer’s specifications. Our inventory includes ultrasound probes from GE, SonoSite, Chison, Philips, SonoSite, Mindray, Medison, Samsung-Medison, Acuson, and Siemens, and many more. Below you’ll find our list of transducers available at the best price. Don’t see what you you’re looking for? Call us today at 877-661-8224, we may have it available! Not looking for a new probe and just want your current Ultrasound Transducer fixed? 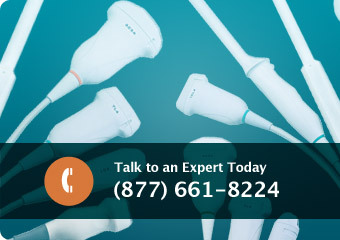 See our Ultrasound Probe Repair page to learn more.